Woodspan PLT Panels are part of Taranakipine, a leading manufacturer of engineered timber products. Taranakipine has evolved from a small family owned sawmilling business based at National Park into leaders in value added engineered wood products using sustainable 100% renewable plantation New Zealand Radiata pine. Now based in New Plymouth the Taranakipine team of 170, manufactures a comprehensive range of timber products including weatherboards, decking and glulam posts and beams for both the local market and for export to Australia, Europe and North America. With a strong focus on research and development, the team at Taranakipine has prioritised product advancements, such as improving structural performance, developing superior coating systems and improving durability treatment processes of wood. We have invested in new technology, with an emphasis on maximising the volume of timber cut from each log – increasing overall productivity and minimising waste. Woodspan PLT Panels are an example of our continued evolution as a business. Manufactured and detailed onsite at the Taranakipine facility Woodspan PLT panels utilise both the manufacturing capability and knowledge base that has been built up by Taranakipine over more than 35 years as a trusted engineered wood product manufacturer to the construction market. 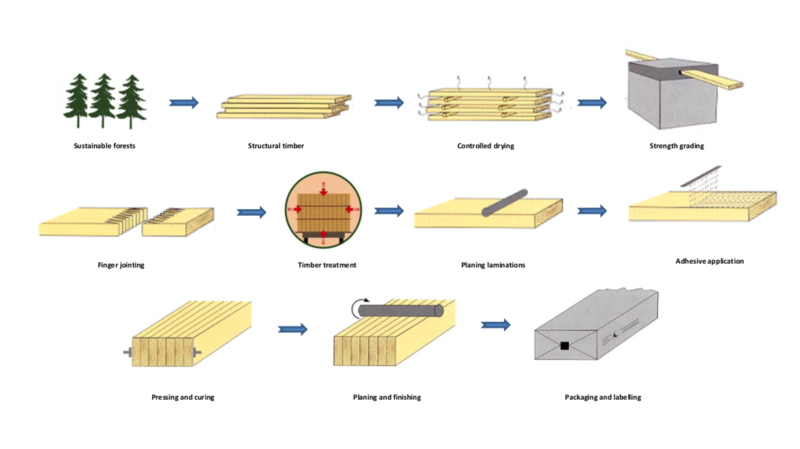 Woodspan PLT (Parallel Laminated Timber) is an innovative engineered timber panel system that is suitable for use in residential and commercial floor and roof construction. Woodspan PLT is made from New Zealand grown Radiata pine boards (finger jointed or solid) that are laminated on edge into large panels with all grain running parallel to the panel span direction – hence the term PLT. Essentially what we are doing is making large glulam beams but, instead of using these in the traditional sense where the glulam beam sits on the flat, we orient them to sit on edge which creates a structurally efficient floor or roof panel. Woodspan PLT is a complete floor and roof solution which includes the manufacture of product as well as the fabrication of panels in the Woodspan PLT factory using precision tooling. Woodspan PLT panels are then sent to site with detailed shop drawings and fixing screws and plywood (if required) for panel to panel connection for fast and efficient installation. Woodspan PLT Panels are suitable for use as floor or roof panels in residential and commercial construction. Download our design guide to help ascertain the suitability of Woodspan with your next project.